Nutmeg is widely used in cosmetics and in flavorings in dental creams, often in combination with peppermint, methyl salicylate and cloves. Historically, nutmeg has been used as a form of medicine to treat many illnesses ranging from those affecting the nervous system to the digestive system. Nutmeg has been used as the active ingredient in commercial cough and congestion preparations such as Vicks cough syrup and in herbal pain relieving ointments. 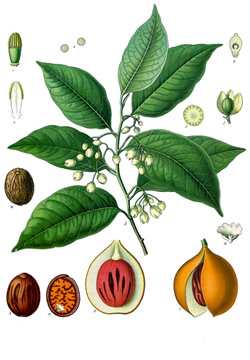 In Ramedica Herbal Wonder Balm, nutmeg oil was again one of the active ingredients. Preparation Methods & Dosage :Nutmeg is used in powdered form in foods, also can be added to herbal teas and be taken as an extract. 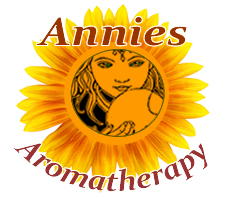 Nutmeg essential oil is used in aromatherapy. 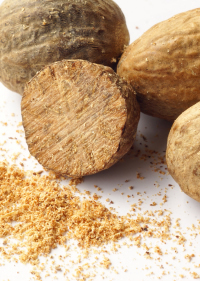 Nutmeg has the characteristic aromatic, volatile, oily-spicy fragrance of whole nutmegs. Nutmeg Side Effects: Nutmeg contains myristicin, a weak hallucinogen, though not at normal culinary levels. Still it is not recommended for dogs. Use of nutmeg as a recreational drug is not practical, and vastly overrated due to its unpleasant taste and its negative side effects (though this doesn't keep people from trying). Buy powdered nutmeg from a reputable source that guarantees that the powder is not made from previously BWP (broken-wormy-punky) nuts. This tropical tree is found in the Moluccas, the Antilles, Sumatra, Java and India and grows to a height of 45 feet producing up to 2,000 nuts per year. The stone of the fruit is enclosed in a husk, when dried is known as mace.